Roots not proliferous. 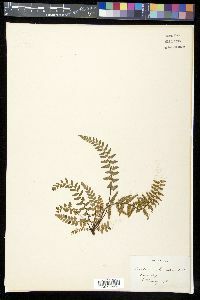 Stems short-creeping to ascending, occasionally branched; scales dark reddish to brown throughout, narrowly deltate, (2--)3--5 × 0.2--0.4 mm, margins entire or shallowly dentate. Leaves monomorphic. 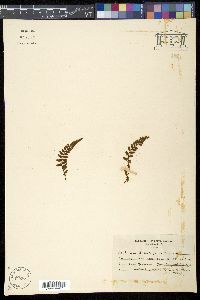 Petiole reddish or purplish brown throughout, lustrous, 1--10(--13) cm, 1/3--3/4 length of blade; indument of brown, narrowly lanceolate scales at base, grading into hairs. Blade narrowly oblong to lanceolate, pinnate-pinnatifid to 2-pinnate, 2--17(--20) × 1--6 cm, thin to moderately thick, sparsely pubescent; base truncate or obtuse; apex acute, not rooting. Rachis reddish or purplish brown proximally, fading to green in distal 1/3--2/3, lustrous, sparsely pubescent. Pinnae in (3--)5--15(--25) pairs, ovate, obovate to lanceolate or deltate-lanceolate; medial pinnae 6--40 × 3--10 mm; base truncate to obliquely obtuse; margins dentate to denticulate; apex acute or rounded. Veins free, barely evident. Sori 3 to numerous pairs per pinna, on both basiscopic and acroscopic sides. Spores 64 per sporangium. 2 n = 144. Acidic rocks, usually on steep ledges; 0--1000 m; Ala., Ark., Ga., Ill., Ky., Md., Mo., N.J., N.Y., N.C., Ohio, Okla., Pa., S.C., Tenn., Va., W.Va. Asplenium bradleyi is a morphologically variable species, the allotetraploid derivative of A . montanum × platyneuron (W. H. Wagner Jr. 1954; D. M. Smith and D. A. Levin 1963; C. R. Werth et al. 1985). The sterile diploid form of A . bradleyi has been collected twice in nature (W. H. Wagner Jr. et al. 1973; A. M. Evans 1988), and isozyme studies indicate that the allotetraploid has had a polytopic origin (C. R. Werth et al. 1985b). Occurring rarely to locally in the Appalachian region, A . bradleyi overlaps with both progenitor taxa, but it is fairly frequent in the Ozark and Ouachita region where A . montanum is absent. 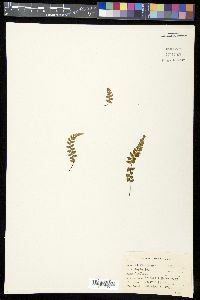 Sterile hybrids with A . pinnatifidum ( A . 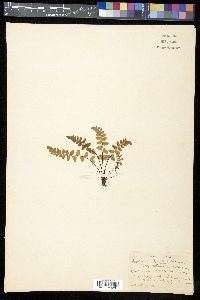 × gravesii ), A . montanum ( A . × wherryi D. M. Smith et al. ), and A . platyneuron are known from nature. Rhizome 1-1.5 mm thick, the numerous narrowly lanceolate scales blackish, 2-4.5 mm; lvs numerous, spreading, 7-25 cm, the petiole brown, to 10 cm; blade linear-oblong, to 20 נ4.5 cm, pinnate-pinnatifid to bipinnate, the rachis brown proximally, green for the distal third or half, bearing scattered slender scales; pinnae 8-15 pairs, alternate or the basal subopposite, short-stalked, deltoid to oblong-lanceolate, sometimes with only one free, superior basal segment (otherwise incised-serrate) or pinnate throughout with 5+ pairs of segments, these obtuse, sharply serrate. 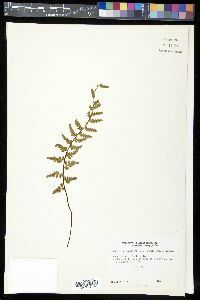 Rare, on noncalcareous cliffs and rocks or acid soil; s. N.Y. and N.J. to Ga. and Ala., w. to O., Mo., and Okla. Name applied to both the sterile hybrid (2n=72) between spp. 2 and 4, and to the fertile alloploid (2n=144) derived from it.